As of today, all of my January – April Willow Sculpture Days at Coates English Willow are fully booked. 1. I do have a publicity mailing list (with MailChimp), by going to my website Contact page, filling in the short form and ticking the box next to ‘SIGN UP TO OUR MAILING LIST!’ you will be able to join my upcoming courses newsletter and receive the next Willow Sculpture Day dates prior to general public release. Joining my MailChimp email publicity list means that you will receive about 3 times a year details and dates of my future Willow Sculpture Animal & Basketry courses. Later this month I will be releasing my May – August 2018 Willow Sculpture Day dates. 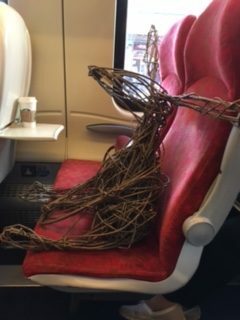 This will give you a head start on booking a Willow Sculpture Day prior to me releasing this information to the general public. 2. I do offer my own gift voucher service. Gift vouchers make great presents for family and friends. Gift Voucher details can be found on my website Courses page. On my receiving your gift voucher payment, you will be sent a personalised gift voucher card. Gift voucher recipients will receive advanced notice of my courses 3 times a year prior to the release of Willow Sculpture Day dates to my MailChimp mailing list. Gift vouchers are valid for 2 years from their issue date. 3. Very occasionally I do get cancellation places, these are usually at very short notice, (within 72 hours of the course taking place). If a cancellation occurs, rather than emailing, I usually quickly phone those on my waiting list. If you wish to be on the waiting list and for any particular Sculpture Days / dates please fill in the Contact page form and make sure that I have a phone number for you. ← Ready for Willow Weaving in 2018? !